To view information and data for a specific gage, click on the colored markers on the map below. Coastal EDEN presents real-time data for the oligihaline/mesohaline zone in the Southern Everglades. These coastal areas, or specifically the Coastal Oligohaline Wetlands Zone (sometimes referred to as "the coastal fringe" or the "zone of change"), are critical in evaluating the hydrologic and ecological responses to modifications of the water delivery system from restoration and future climate change. Hydrologic changes, either from flow alterations or climate change, will first be manifested along the coastal fringe. These areas experience tidal backwater conditions, and increases in flow and (or) sea-level rise may move this seaward or landward. Coastal areas will probably exhibit larger relative changes in hydroperiods as compared to inland areas. This page allows you to display current hydrologic data for USGS-operated coastal stations in south Florida. 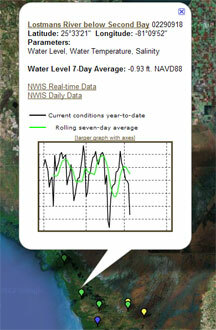 These data are stored in the USGS National Water Information System (NWIS) database. To download current and historical data and data for other discontinued and non-real-time gages, go to South Florida Hydrology Data Download. Download the Coastal EDEN metadata record. Coastal EDEN stations and measured parameters are listed below. Click the station name to go to the EDEN Station Information page.